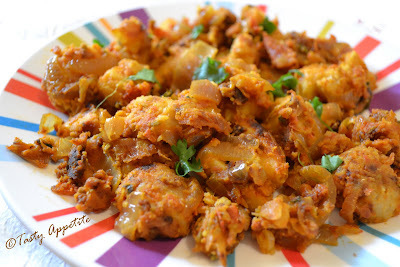 Seppankilangu roast is a delicious and favorite fry among the South Indians...!! Also this veggie is commonly known as Colacasia / Tara root or Arbi. 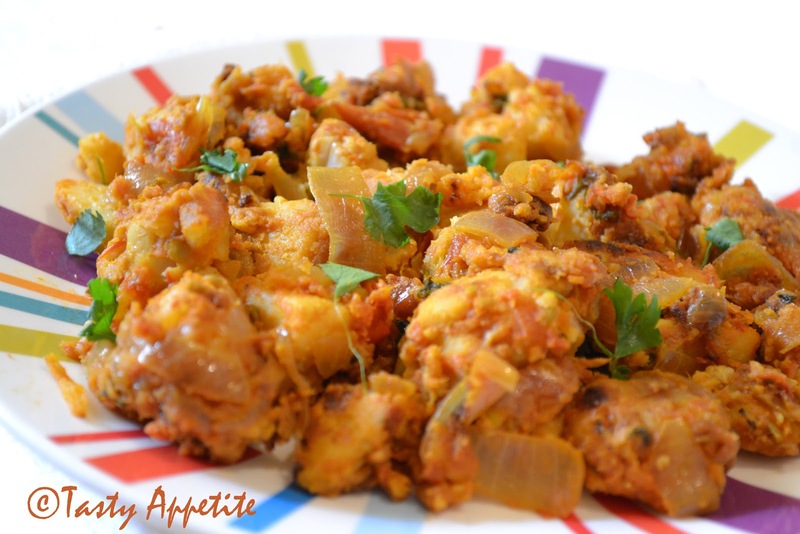 This dish is very simple and easy to cook. Also it makes a great side dish with variety rice menus. Here goes the favorite Seppankilangu Varuval recipe. Enjoy..!! Wash and pressure cook the colacasia, until it is well cooked. Take care not to overcook, as the fry may turn messy. Add finely chopped onions, curry leaves and sauté to light brown. Now add the tomatoes, turmeric pwd, red chilly pwd, salt and fry until the tomatoes are cooked. Add ¼ cup water and cook covered. Once the oil separates from the fry, add the sliced colacasia and mix well. Simmer and deep fry till the outer layer of the colacasia turns golden brown and crispy. Remove from heat. Sprinkle freshly chopped coriander leaves. Makes an excellent combo with any rice dish. This is so unique, it looks beautiful. I am really hungry now. Yummy stir fry...Great side for rice..
Colacasia is my favourite. Stir fry looks yummy..
Looks really yummy and spicy... and the way you described it, I feel like having it now. Bookmarked this. Hola!! Muchas gracias por tu visita, es un placer conocerte y quedarme por aquí viendo las comidas ricas que haces. 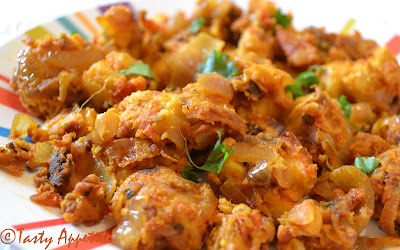 Super delicious seppankizhangu fry, serve me with rasam rice,i'll finish that whole bowl..
Wow.....that looks absolutely yummy.... mouthwatering recipe. Arabi is my favorite. Urs look very tasty. Yummy! Love the addition of saunf powder. This looks so flavoursome and delicious! 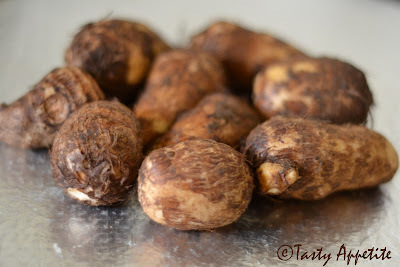 Arbi is my favourite too...delicious! Sounds very interesting...new dish to me! Looks so yummy!!! 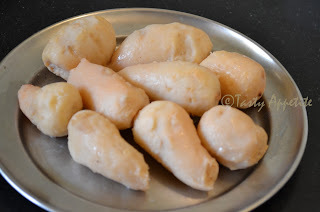 Nice recipe with yummy clicks..loved it! Send across the plate please. I love it Jay. Not my favourite vegetable but done this way, with rice -yum! Wow... my favourite veggie..:) Yummy yum..
What a lovely & mouthwatering stir fry!!! Cant take my eyes of the pics..
droolworthy arvi fry looks very tempting to grab. Pass me the entire platter jay. it is tempting a lot. 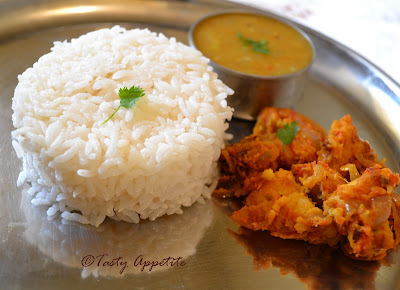 I'm learning more about South Indian cuisine - it looks wonderful. With rice, yum! Great dish Jay. Never had it before. One of my favourite Jay..looks absolutely inviting. Yummy fry! Perfct with rice! This recipe is new to me, but it will be delicius. yummy yummy !! Looks delicious ! my fav...Looks super delicious and inviting..
Hi Jaya, ur recipe is such a mouthwatering!!! i love taro root sabji:) Must try your recipe. that goes well with rice. good choice. must try. I am now your newest follower. I found you on Miriam's site. Wonderful blog! Sounds delicious Jay. Love your presentation. Hey Jay that looks delish......ive got some awards for you :) drop by to collect it.....Cheers! Mom's recipes are always the best isn't it ? These look super yummy Jay :) . Gracias por tu visita a mi blog, Me encanta vuestra cocina y me alegro de poder tener contacto con tigo para aprender de vuestras costumbres. I don't think I've ever had this before - sounds delightful! I wish I could make it, but it's tough to get the veggie here in Toronto. Hey Jay, u're making me drool with this awesome dish! Promote Your Blog @ Shirley's Luxury Haven! DIY This X’mas With 12 Lovely Recipes! wow.............yummy dish. very innovative idea according to me. I invite u to participate in my blog's first event ' INNOVATIVE PAKWAN'. 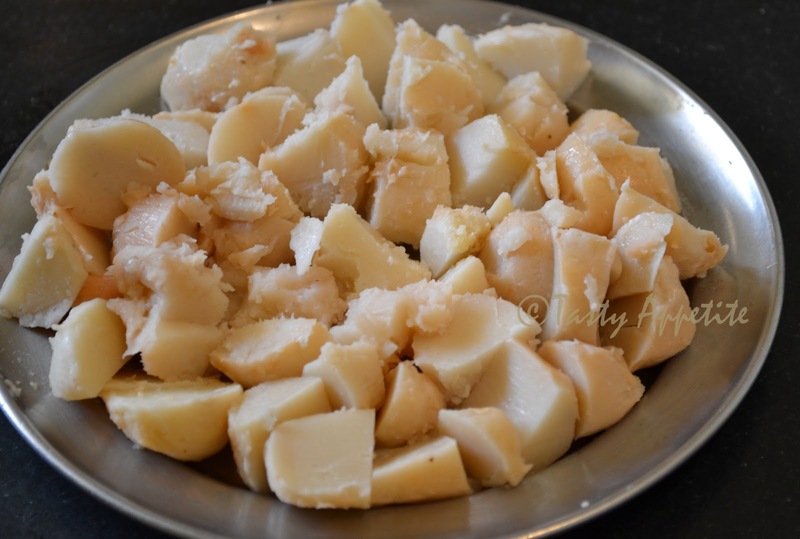 I remember eating it at Rammurty aunty's place at Nagpur. Thanks. I have tried other recipes using arbi, and this was the best one . I made this dish and was awesome.